I made this arisi paruppu kanji/ rice dal porridge recipe for Aadi velli today.My MIL has the practice of offering this porridge for Mariamman on Aadi velli/friday. We call it as Mariamman kanji. My in-laws are with me for the past two weeks and we are having great days together. This time I learnt some yummy authentic recipes from her.This is one among them.In this porridge I have used rice & moong dal.It very easy to make & can be made in minutes.No need to roast the rice or dal.Its good for babies too.Today I prepared this porridge for the first time and offered to Mariamman .It tasted yum.My in laws like this salty porridge more than the sweet ones and they usually have this for breakfast.Its a very filling & easily digestible porridge.Do try this easy porridge recipe for Aadi velli and get the blessings of Amman .Let see how to make this one step rice and dal porridge recipe..
Do check out my rice porridge recipe for babies. Wash the rice and dal and take in a small pressure cooker.Add 2 cups of water and the required salt.Pressure cook for 2-3 whistles in low flame.It takes 10-12 minutes. After the steam is released,open the cooker and add 1/2 cup of boiled milk.Give a boil.Adjust the consistency as u wish by adding more milk or water.We make it in spoonable consistency.Transfer to a serving bowl. Just before offering,pour a tsp of melted ghee & a small piece of jaggery on top. Offer to GOD and enjoy ! Do not forget to keep a small piece of jaggery & a tsp of melted ghee while offering to GOD.Its a must ! 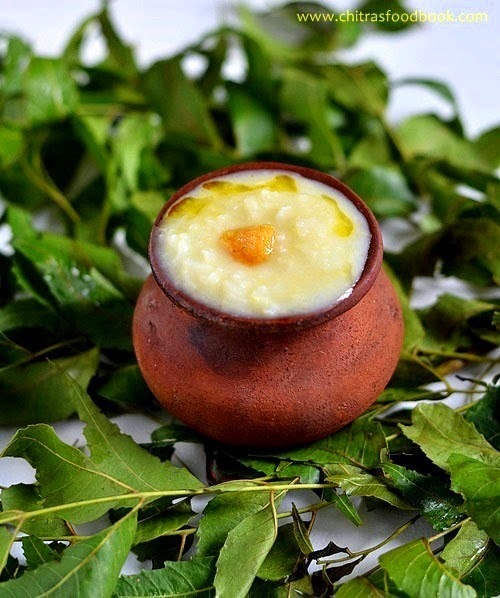 Make this simple and healthy porridge for Aadi velli & get the blessings of God !